Plaça de les Glòries is one of metropolitan Barcelona's most important hubs, the point where three of the city's main roads meet. In a state of constant redevelopment since Ildefons Cerdà created it at the start of the 20th century, its profile is marked by the modern buildings that surround it. 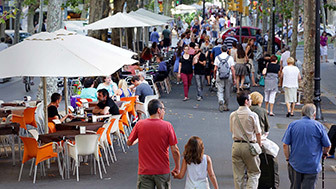 On the border between the Eixample and Sant Martí, almost touching the Poblenou neighbourhood, Plaça de les Glòries was built as a meeting point for the city's three main roads: Gran Via de les Corts Catalanes, Avinguda Meridiana and Avinguda Diagonal. And given the spirit of constant renovation that imbues Barcelona, it has been redesigned several times in the course of its history to improve access to the city. The area around it, combining an atmosphere of popular tradition and radical modernity, constitutes an extremely important cultural and architectural microcosm. 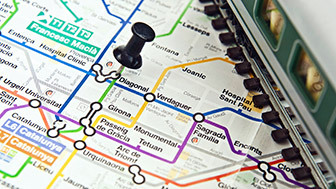 This is where you will find two outstanding cultural centres, the Teatre Nacional de Catalunya and the Auditori concert hall. 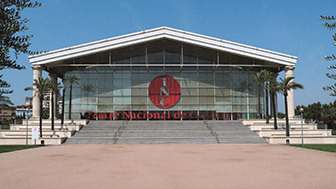 Alongside these, other notable buildings include the famous Torre Agbar, by the French architect Jean Nouvel, the Disseny Hub design centre building and the new Mercat dels Encants building which, since 2013 has housed the popular Fira de Bellcaire, an old flea market traditionally held on one of the sites around the square but now sheltered under the impressive, ultramodern structure of this triangular building. It is worth wandering round the stalls and having a look for treasures. Famous for its industrial history, is now one of the city's most cosmopolitan neighbourhoods.